The Indian economy has emerged as one of the most robust economies of the world, as was evident during the recent global meltdown. 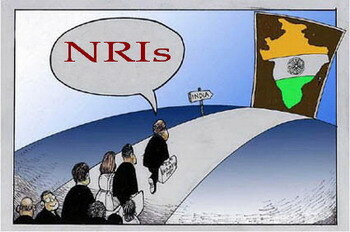 Despite the difficult times, investments in our home land continue to be lucrative to Non Resident Indians (NRI). Funds invested in India not only yield higher returns when compared to investments in the US or other European nations, but also gives a sense of security to the investor. The private sector, characterised by its dynamic and competitive nature, has been a key driver for the economic growth witnessed by India in recent times and presents considerable scope for foreign investment. The Foreign Exchange Management Act, 1999 (FEMA) defines NRI as a person resident outside India who is an Indian citizen or a Person of Indian Origin (PIO). FEMA broadly regulates matters related to NRI investments viz., investment in immovable property, foreign exchange, bank deposits, government bonds, investment in shares, units, securities, and foreign direct investment in India. However, due consideration should be given to Income-tax implications on income generated from investments in India and to Reserve Bank of India (RBI) regulations. The purchase consideration should be met either out of inward remittances in foreign exchange through normal banking channels or out of funds from the accounts maintained in India as mentioned above. NRIs can also avail loans from commercial banks for purchase of immovable property. General approval has been granted by RBI to financial institutions for granting loans to NRIs. Repayment of loans can be made out of the NRE/NRO/FCNR accounts maintained in India.